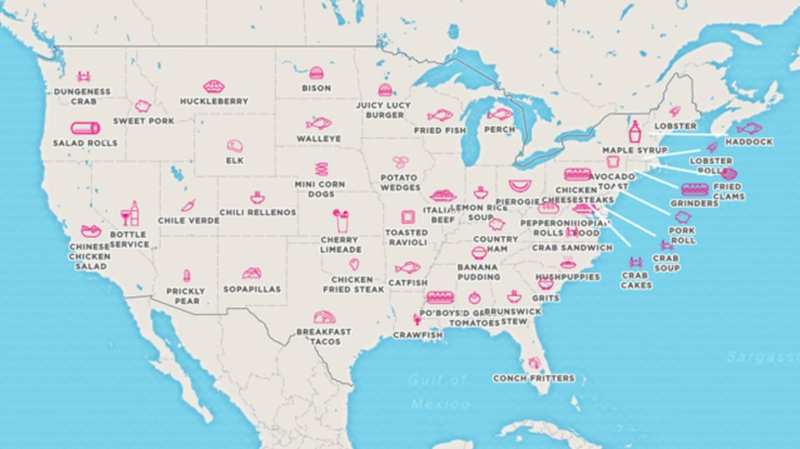 Foursquare and Mapbox teamed up to create this fun map showing the most distinctive foods in each state. That means what food is more likely to be sought out in one state compared to the other states. The data was collected from Foursquare check-ins, so the map is really about seeing what people want to try when visiting a different state. So according to this map, you should grab a breakfast taco in Texas, but skip the food in Nevada and hit the club. The Afternoon Map is a semi-regular feature in which we post maps and infographics. In the afternoon. Semi-regularly. We spotted this one on io9.com.